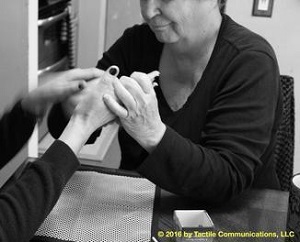 Tactile Communications is committed to maximizing the autonomy of DeafBlind people by providing necessary training in a linguistically and culturally appropriate setting. Our aim is to give DeafBlind people the tools they need to become active, productive members of society and in doing so, to improve the quality of their lives. Page description: 5 black and white pictures. You can either scroll over each image for a photo description or scroll down on this page for a description for each of the black and white images. Image description: b&w picture of two people, a man (Roger) and a woman (Terra), sitting on a sofa, ProTactiling. Terra is sitting on the right, while Roger is sitting on the left. Terra is signing, while Roger is tactiling with one hand and the other is holding a pen. In the background, several different types of plants are sitting on a table. Image description: b&w picture of a woman, Theresa, whom is wearing a black long sleeve top, using PT with another person whose face is not seen except for their hands (their nails are painted black). Theresa, pictured, is "drawing" a map on the person's hand. Image description: b&w picture of two people sitting at a table with a braille device, both wearing a black long sleeve shirt, and both are ProTactiling. The woman on the left, has her left hand on the person opposite of her, while her right hand is under the table, tapping (yes) on the person's knee. Image description: black and white photograph of two people sitting on a sofa, ProTactiling. 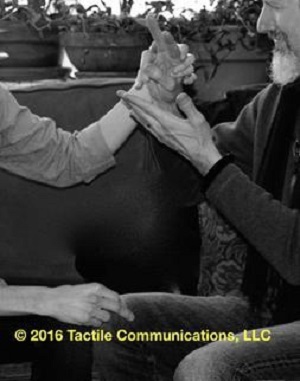 The person on the right, Roger, is signing as the person on the left (face is not seen) is tactiling with one hand while the other hand is using PT, signing, "No" on Roger's leg. Image description: black and white image of the water at the beach with five boulders emerging from the water. Towards the bottom of this b&w image, are a pair of hands using ProTactile (PT). 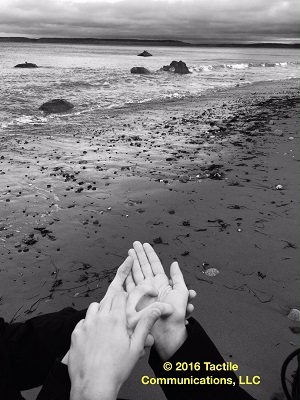 The one pair of hands is displaying the positions of the rocks in the water on the other person's hand.